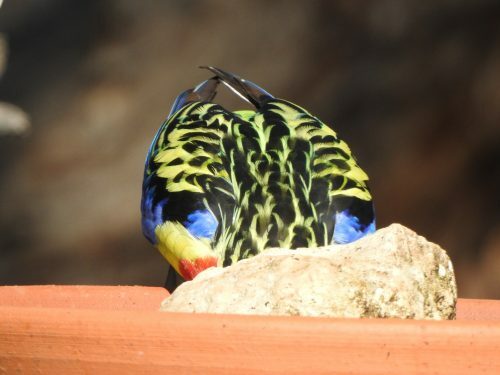 The beauty of our Australian parrots never fails to impress me. 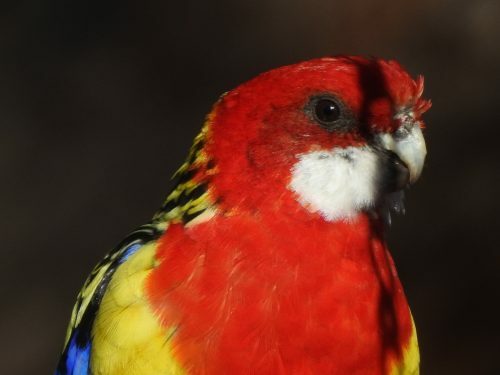 One of the most beautiful to my eyes is the Eastern Rosella which I have featured in today’s photos. All of the photos shown in today’s post were taken in my garden on the outskirts of Murray Bridge which is about 80 kilometres south-east of Adelaide in South Australia. This particular individual has been resident in my garden for several years now. I usually see it every day but I am sure that it roams over a much greater area than my 2 hectare (5 acre) property. 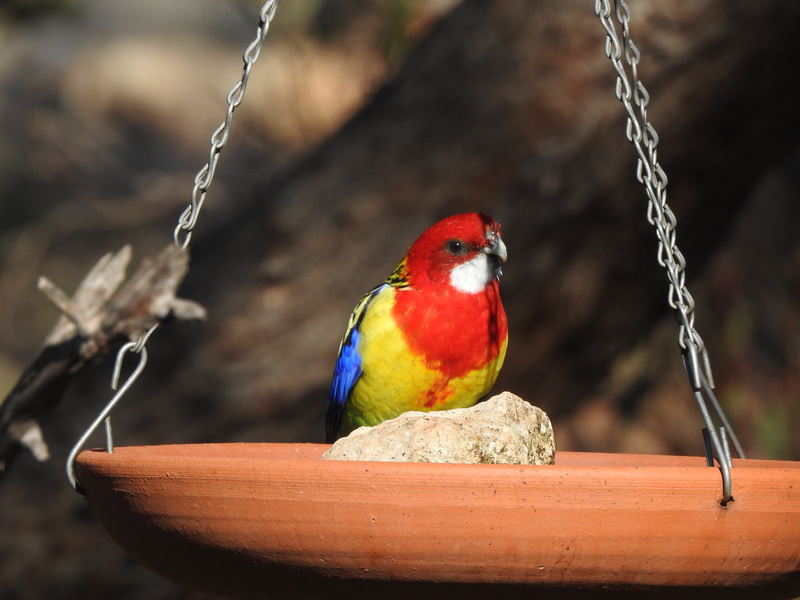 One of the odd things about this bird is that it continues to keep the company of a family of Mallee Ringneck parrots. The ringnecks are also a resident species and they also roam away from my property most days. Some days they will hang around feeding in my trees for most of the day, sometimes creating quite a din with their noisy chatter. 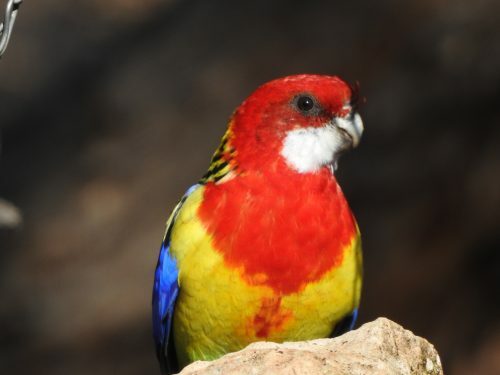 One of the odd things about this rosella is that I am quite confident that it is the same one I am seeing all the time. They are not normally found in this part of South Australia. Their usual range is the extreme south-eastern part of our state. They are also quite common in the Adelaide region and the adjacent Adelaide Hills (Mt Lofty Ranges) where they have been introduced. The species is extending its range, either from the south, or from the west. I lean towards the first conclusion, mainly because I have not seen any more of this species anywhere around this area. Whatever the reason, I am delighted that it has decided to call my garden “home”. I am also pleased that it frequently visits the bird baths I have close to my sunroom. This enables me to get good photos of it every so often. Up until this series of photos were taken, I hadn’t fully appreciated the beautiful markings on the back. The photo below shows these markings really well. On the first weekend of March earlier this year my wife and I travelled to Peterborough in the mid-north of South Australia. My wife was attending a quilting seminar and we stayed with family while there. While she was attending the seminar I did a few hours of birding around town before the day became too hot. 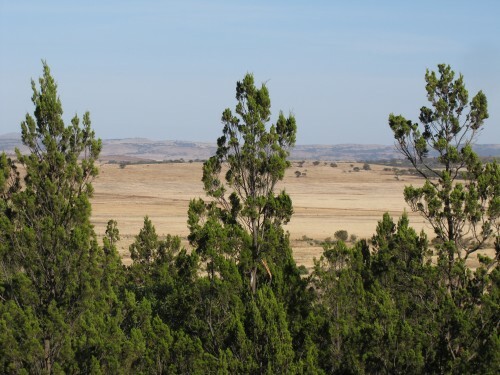 The first place I ventured to was the Greg Duggan Reserve on Lookout Hill on the northern outskirts of town. 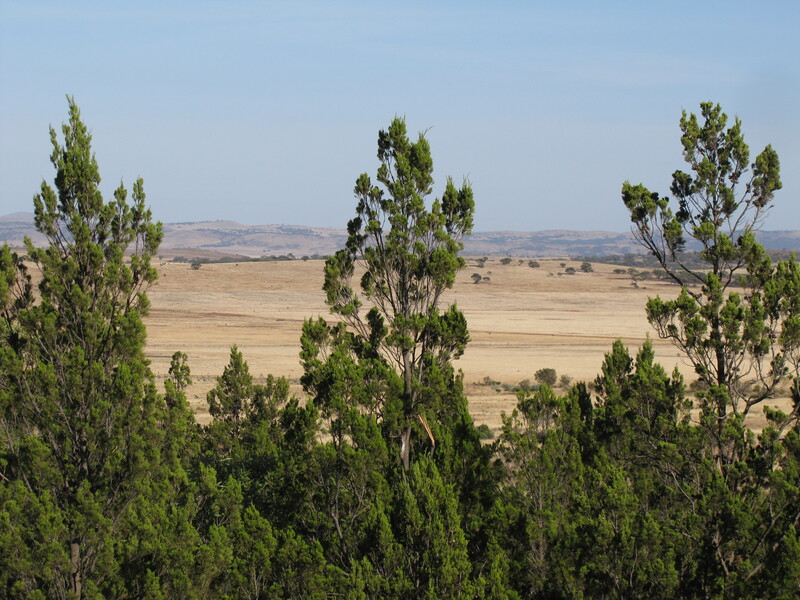 This lookout gives a great view in all directions over the adjacent farming country surrounding the town. This small reserve is also a fine retreat for some of the local birds with over 70 species having been recorded there over the years. 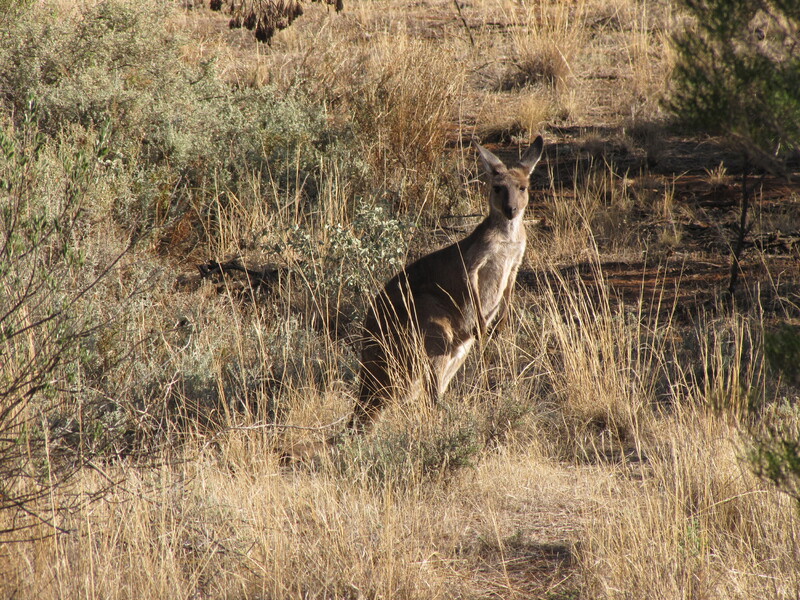 I had a good look around and managed a few good photos of a Western Grey Kangaroo (see photo below). As I was leaving the lookout, which has a good ramp with wheelchair access, I heard the unmistakable and noisy call of a Mallee Ringneck Parrot. With very little effort I tracked it down and managed a few good photos which I have shown above and below. Next thing this bird was joined in a noisy duet with another bird which was walking along the railing of the lookout (see photo below). This chorus continued for several minutes before both birds flew off towards the town. 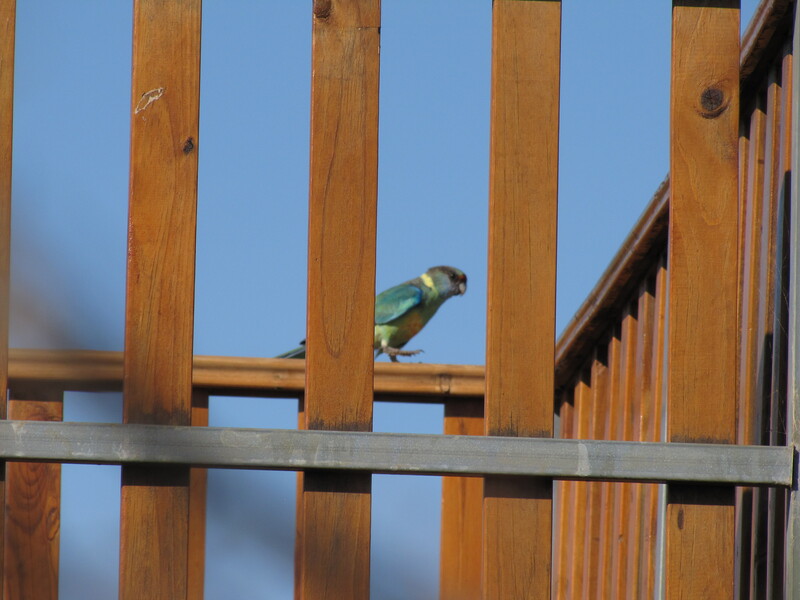 On our property in Murray Bridge, we have a noisy family of Mallee Ringneck parrots which are a resident breeding species in our garden. We get a little annoyed with them when they nibble at our pears as they are ripening on the trees. Mallee Ringnecks are a widespread species in the drier mallee areas of Australia. 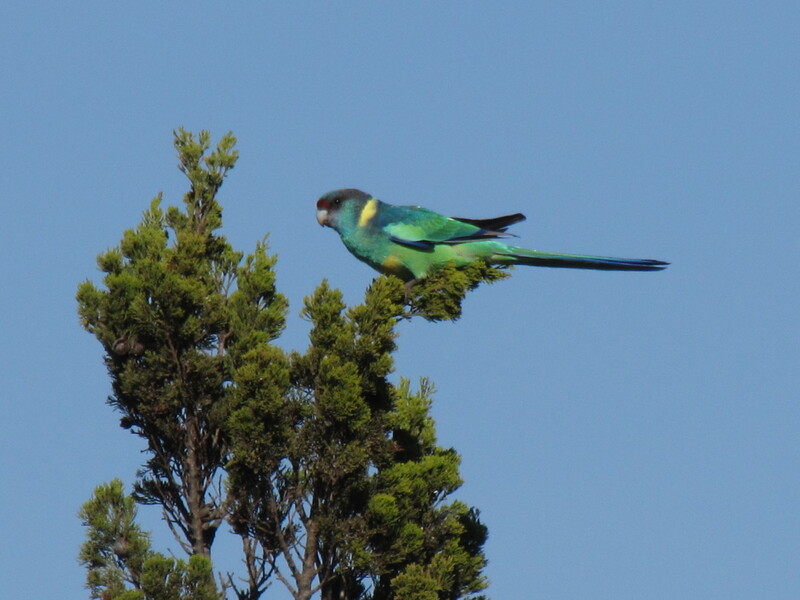 The Mallee Ringnecks are a sub-species of the Australian Ringneck, a widespread species with several other sub-species. For more about the fauna of the Greg Duggan Reserve in Peterborough read my article called The Wildlife in the Greg Duggan Nature Reserve. Last night we were watching television with the lounge door open; it was a pleasant summer’s night. During a particularly quiet segment of the show we were watching we suddenly heard the churring call of our “resident” Australian Owlet-nightjar. “He’s still around,’ we both cried out. I use the word “our” loosely. It is a wild bird in the natural environment so we do not own it. I am not sure if this particular bird is actually a resident on our 5 acre property. We do hear it often enough to think that it is here most days, but have no proof of that. I have no idea if it is a male or female – to call it “he” is more of a generic term. Over recent months we have not heard this bird calling many times at all, so it was delightful to hear the call last night. I like to think that it is quite contented living around here most of the time. A few years ago one bird – perhaps the same one – took up occupation of a significant hollow in one of our mallee trees in our back yard. Amusingly, during the cool winter months it would emerge from the hollow every morning around 11am and sun itself in the opening of the hollow, call a few times and then retreat to sleep until evening. Sometimes we would even hear it calling again as it went out feeding during the night., being mostly a nocturnal species. It was on one of those occasions that I was able to sneak up closer for a photo (shown above). Over the last two summers the hollow has come under the “ownership” of a pair of Mallee Ringneck parrots who have successfully added to their family each time. Lately they have been busy feeding two very persistent young ones which have recently fledged. This morning I was busy at my desk in my home office when I was startled by a sudden loud thump on the glass of the window about a metre from me. From time to time we are used to having birds fly into the glass of our windows. Usually the bird takes a few moments to recover before flying off. While it is stunned it is sometimes possible to get good close up photos of the bird in question. I looked out the window but couldn’t see the poor victim. Grabbing my camera I raced outside. A Mallee Ringneck parrot was on the ground a few metres from the house, sitting quietly while it recovered from the shock. I quickly took the shots on this page before leaving it in peace to recover. I checked about ten minutes later and it had flown off. I’ve always admired these beautiful parrots, but in examining the feathers up close in the morning sunlight highlighted the amazing colours of the feathers. 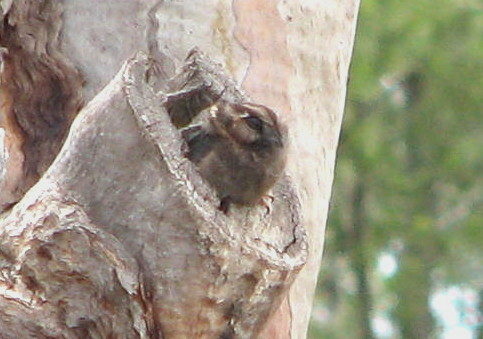 This species is a resident breeding bird in our garden and nearby mallee scrub. This close encounter has given me a fresh appreciation of this bird. We have many birds in our garden. There is a constant passing parade of parrots, honeyeaters, choughs, babblers, magpies, ravens and over a hundred other different species (113 at last count). Being a birder this abundance brings a constant delight. There is always something happening. There is always something to look at. There is always something calling. There is constant activity. Near our front door we have a beautiful little Eremophila maculata bush (compact form), an Australian native. When in flower this little bush, which is not yet half a metre high, is covered in the most delightful wine-red flowers. Sometimes the ground below is covered with partly chewed bits of the flowers. 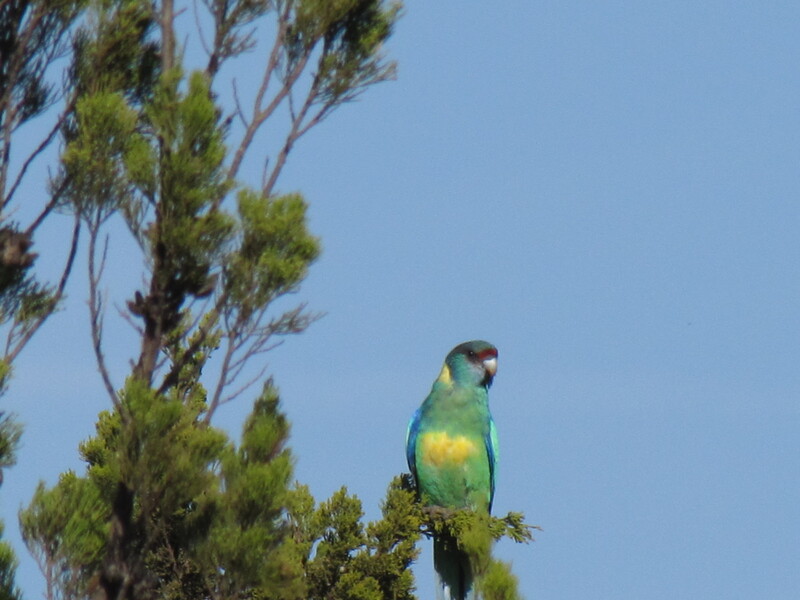 Now we know the culprit, the Mallee Ringneck Parrot. We caught him in the act – and on the camera (see below).